10 Things you Didn't Know about a Sandals or Beaches Vacation! Planning a large family getaway or want to splurge on a butler elite suite? You can start planning your vacation now!! The most elite suites sell out fast, so it's best to book as early as possible!! With gorgeous options in St. Lucia, Barbados, Antigua, Bahamas, Jamaica, Grenada, Turks and Caicos what are you waiting for!!! Sandals and Beaches resorts only require a $400 deposit per room to secure your reservations. You can then make interim payments anytime, with your final balance being due 45 days before arrival. You may add air to your reservations, but air must be paid in full at the time that it's added. Beaches resorts are perfect for the whole family! From infants to teens the kid’s programs do not disappoint!! Teens love the Scratch DJ Academy® and toddlers adore the Sesame Street® Characters. They are a popular choice for destination weddings since there are no age restrictions on guests. Gourmet dining options abound; adults will love the top shelf spirits. It's well known that Sandals and Beaches resorts include all land and water sports, but did you know that also includes unlimited Scuba? Sandals Newton Dive Boats are custom and are sure to impress. On average 35,000 guests dive per year and 25,000 receive their certification ($90) at their resort. All Sandals resorts are PADI 5 Star and PADI Green Star Certified. Kids ages 8+ can get into the action also at Beaches with the Padibubblemaker Experience and Seal Team Program! Sailing is available for ages 8+ (small fee applies). Sandals and Beaches Butler Elite guests receive the amazing service of a private butler. All butlers are trained and certified by the Guild of Professional English Butlers. Your butler will greet you upon arrival, arrange dining reservations, offer to unpack your bags, bring your favorite drinks to you poolside, bring lunch to you on the beach among other amazing amenities. Considering a wedding and honeymoon with Sandals? Couples may "test drive" their WeddingMoon® with a 2-night stay starting at $500 per couple. Travel must be completed by December 2017. During your stay your will meet with the wedding and photography team. Enjoy a sparkling wine and cake tasting, dine at the resort restaurants, tour the nearby properties and enjoy a romantic dinner with white glove service and sparkling wine. Each couple will receive a complimentary 5 x 7 photo. Your Sandals or Beaches vacation is always 100% top shelf all-inclusive and that includes signature dining!! You will find up to 16 gourmet restaurants per resort, up to 12 top shelf bars serving premium spirits, enjoy endless glasses of Robert Mondavi wines and savor cuisines from all over the world. You will find everything from Italian to Caribbean to Asian to popular Steakhouse offerings and everything in between! Be sure to bring your appetite! Plan a visit to Sandals Emerald Bay Resort in Great Exuma, Bahamas. 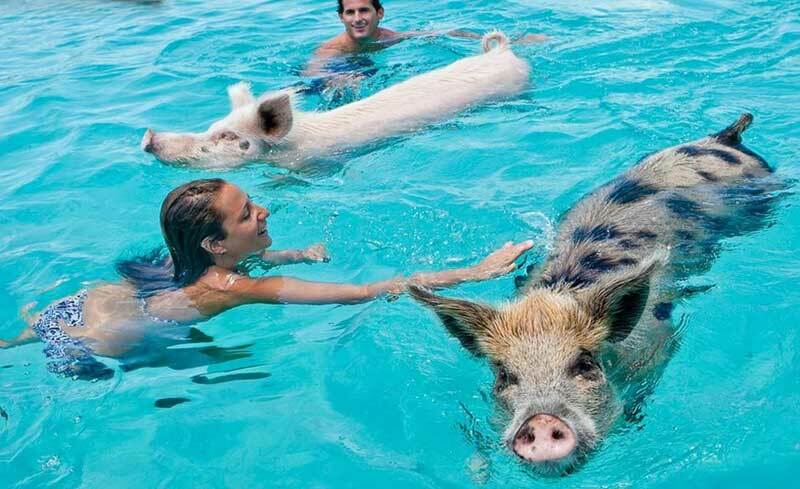 Swim in the crystal clear waters, enjoy the spa, golf, and tennis and leave time to swim with the wild pigs! Excursion available through Island Routes.